PowerPoint provides users with the ability to save their presentations as a Webpage. This allows you to upload you presentation to a web page so others can view it on the web. A case in which this would be useful is an instructor that would like the presentation lecture to be available to his/her students. This will open a new in window. 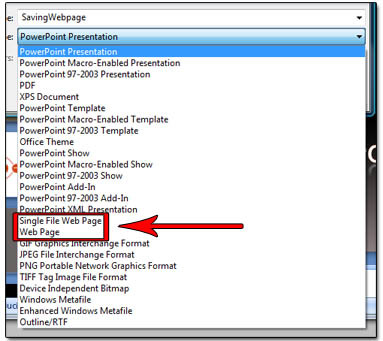 There are 2 options for saving the presentation as a web page. 1. Single File Web Page – By using this format, all sounds, images and animations will be embedded in the web page, and the presentation will be saved as a .MHT file extension. The Page title will be the title of your presentation on the web page, so chose a page title that is related to the presentation. After you have chosen a page title, hit Save and your done!